Joseph Whitfield, depicted on the DVD cover above. "As Washington, D.C. goes spiritually, so goes the Nation!" 60 Evangelical organizations sponsored this unprecedented event with the desire to see come together Jew and Gentile, Black and White, Fundamentalist and Charismatic – that Yeshua’s prayer in John 17 would come to pass in the Nation’s Capital: "That they might be ONE, that the world might BELIEVE!" God used Manny’s message and the washing of the feet of an Afro-American, Bishop Joseph Whitfield, and Sandra’s testimony and songs to touch lives. Clergy asked forgiveness for 1,900 years of brutal anti-Semitism by the "Church." BELIEVERS OF MANY ETHNIC BACKGROUNDS SET FREE! American Indian: "I forgive you. I bawled like a baby as the Lord released me from my hurt and outrage against the white man for their treatment of my people." Jewish Believer: "The humility of a white man washing a black man’s feet. I was way in the back and felt the humility! The power of God in the sanctuary was so strong you could touch it. 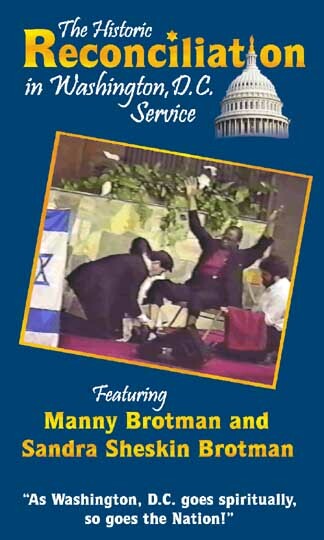 I almost died when Manny washed the black pastor’s feet and all the different reconciliations going on, black to white, white to black, Hispanic to Jew." Filipino: "Little did I know that the Holy Spirit intended for me to be here so that I could discover about myself a well-concealed, insidious fear and hatred of white people. That discovery came right about the time that Manny knelt down to bathe the feet of a black brother in Messiah." East Indian Catholic: "It was the first time I ever saw Jewish people praising Jesus. I was very much afraid about ministering to unbelieving Jews; but, that night I lost all fear and was revived! I dedicated my life to reaching the Jews with the Gospel and love of Yeshua. I felt like Paul that night when the scales came off my eyes and all fear was taken from me!"